I upgraded from Tiger to Snow Leopard. In Tiger I could eject disks or downloads from Finder windows without the window disappearing like it does in Snow Leopard. 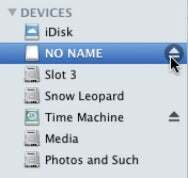 Is there any way to eject things without losing the Finder window in Snow Leopard? What we’re talking about is ejecting volumes, drives, or discs by clicking the small Eject icon in a window’s sidebar. What you’re seeing is the expected behavior (meaning it’s not a bug) if you’ve first selected the volume and then clicked its Eject icon. And it makes sense that it would work this way. Select a volume and press Eject and you'll lose your Finder window. When you select that item, you’re telling Finder that you want to see its contents listed in the open window. When you click the Eject icon, you’re unmounting the volume, drive, or disc. The window that displayed its contents is going to disappear right along with it. If it didn’t, what would the window display once its host has vanished? So, the simple trick is this: Don’t select the volume, drive, or disc you intend to unmount. Select something else and then click the Eject icon next to the item that you’d like to send to the Great Beyond. Do so and the Finder window stays open.